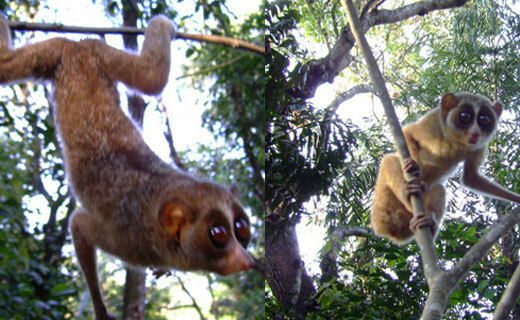 The Slender Loris is a small primate that is found in Sri Lanka. Currently listed as endangered the Slender Loris is losing its habitat due to human expanse and agriculture which is causing the Slender Loris population to plummet. The Slender Loris which gets is name from its long slender limbs is found predominantly in the forests and tropics of Sri Lanka around the southern border. 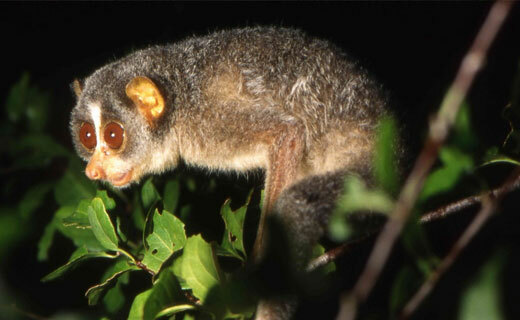 The Slender Loris is sometimes referred to as the ‘Red’ Slender Loris and is closely related to the Gray Loris. Slightly smaller than its cousin the Slender Loris has a face which is dominated by its massive eyes which help with the ability to see at night which is essential when hunting because the Slender Loris is nocturnal doing all of its hunting at night. The Slender Loris has large rounded ears which are hairless at the edges however most of the ear is covered in fur like the vast majority of the Slender Loris’s body. The fur of the Slender Loris is soft and think and can range from gray to red and brown but always with a white under-side. The Slender Loris also has no tail. As the Slender Loris inhabits the southern area of Sri Lanka then it should come as no surprise that its preferred habitat is that of tropical forests although sightings have been reported of groups living on the coastal stretch which is unusual. Throughout the day the Slender Loris sleep in groups nestling high up on tree branches before venturing off alone at night to find food which consists of insects and the occasional lizard or bird egg. Currently we do not have much information on the social life and hierarchy of the Slender Loris however it is known that mating can take place throughout the year with no restrictions. Female Slender Loris’s gestate for around 6 months after successful mating and then further nurse the new born for a further 6 – 7 months. The average lifespan of the Slender Loris is believed to be around 16 years. how do i cite this in apa? !